A cross between Doitsu and Asagi, Shusui was one of the first Doitsu varieties of Nishikigoi. Shusui have a neatly arranged line of dark-blue scales along the dorsal line, on a pale-blue skin. The head should be light-blue and it should have red on the cheeks. The abdomen is bright orange or red, like the Asagi, as are the fin joints. - Hi Shusui: where the Hi spreads up from the abdomen covering the back. - Hana Shusui: similar to Hi Shusui but with another line of dark-blue mirror scales along the lateral lines. - Ki Shusui: very rare, yellow instead of red with the back scales usually blue. - Pearl Shusui: very rare, it’s supposed to have silver scales. Shusui is the Doitsu version of the Asagi. All criteria and characteristics of Asagi also apply to Shusui except there is no netting pattern but a sky blue top half of the koi. It is very important there is no break in the line of mirror scales from the back of the head along the dorsal fin and the scales line up in straight rows. Again, a clear head is very important. It is difficult to keep black spots from appearing on Shusui in hard, high pH water. 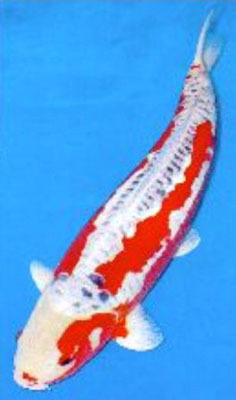 A Shusui with red almost covering the back above the lateral line is called "Hi Shusui". A Hi Shusui with the addition of blue mirror scales on both lateral lines separating the red top and bottom is called "Hana Shusui". Doitsu-type Asagi with clear blue scales along the dorsal ridge are called "Shusui." 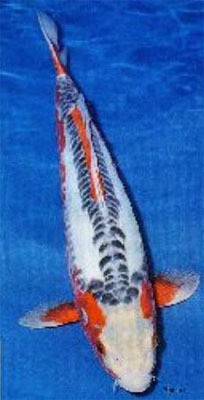 First produced by crossbreeding a mirror carp with a Asagi Sanshoku. The sharpness of deep blue scales neatly aligned on both sides of the dorsal fin make the Shusui a beauty. A single line dividing into a double row of clear blue scales (on both sides of the dorsal fin) is indispensable for Shusui's beauty. If these scales are grey or light Sumi, it will downgrade the koi. Spots are often seen on the back, which also mark their value. As in Asagi, the head should be preferably solid white or light blue. The nose, cheeks, and fin joints are required to have Hi on them. Although Hi is a secondary requirement for Shusui, bright Hi is still preferable. Hi tends to spread over the back, but most cases this is undesirable. Neatly aligned scales are important for the Doitsugoi. Their beauty is an essential factor in deciding the value of the Shusui. Large scales may be found between the back and the abdomen in some Shusui, but these are distracting. Some scales often form in a clump on the shoulders, and if they are symmetrical, are allowable. Among the types of Shusui are "Hana (Flower)," "Hi" and "Ki Shusui". Hana Shusui are koi with round red markings on the sides (between the back scales and the lateral line). Hi Shusui are koi whose Hi spreads over the back. Ki Shusui have yellow instead of red colouring. Their back scales are usually blue. Some Ki Shusui have black scales on the back and are called "Ki Matsuba Doitsu". There are many other varieties produced by crossbreeding Shusui, one is the Hikarimono group such as the "Kinsui" and "Ginsui" by crossing the Shusui with an Ogon.